Drawing on the rich artistic heritage of Hackney Wick, The Gantry is a 21st century cabinet of curiosities made up of 21 individual creative studios. 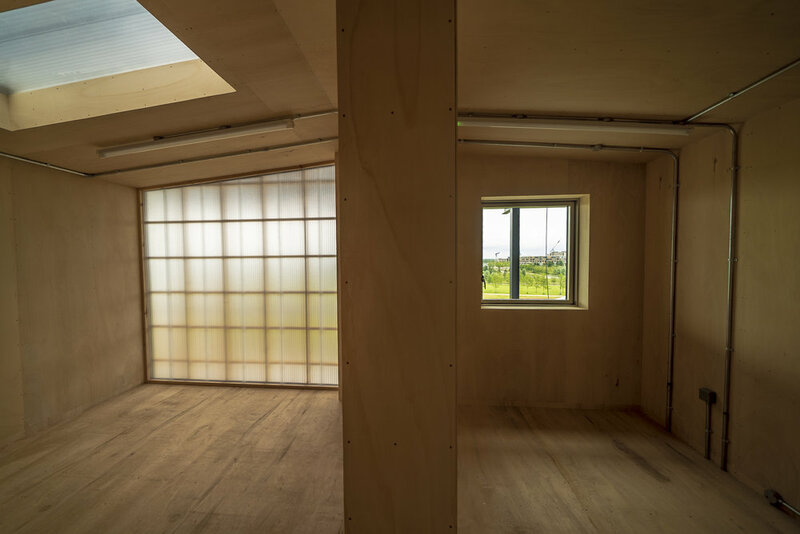 Designed by architects Hawkins\Brown, the studios are part of the largest scale project in the world to be built using WikiHouse open-source technology. Set within a gigantic gridded structure on the side of The Broadcast Centre at Here East facing Queen Elizabeth Olympic Park. Now building is complete, we're proud to announce our new partnership with The Trampery and reveal the plans for 'The Trampery on the Gantry'. The Gantry construction was the final piece of the jigsaw at Here East and is an integral part of our growing campus. We’re delighted to partner with the team at The Trampery, leaders in building creative communities, to deliver these important next steps. The Trampery on the Gantry will provide 10,000 square feet of low-cost studios for Hackney Wick’s creative community many of the studios offered to creative businesses based in the Hackney Wick community. All the studios will be offered at rates that are affordable for artists and small creative businesses. The new creatives who join this space will immediately become immersed in the wider Here East campus, placing them at the centre of a thriving community built on collaboration. In addition to being part of The Trampery on the Gantry’s creative hub, they will also be able to tap into the collaborative network of creative and technological businesses at Here East, from Studio Wayne McGregor to UCL’s Robotics Lab and V&A East.